ARP Ultra Torque Lube UNIVERSAL - MiataRoadster - Stay tuned with MiataRoadster! 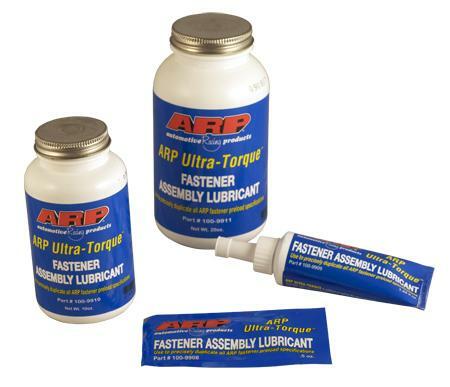 ARP Ultra-Torque fastener assembly lubricant has been specifically designed to reduce tension pre-load scatter and eliminate the need to cycle high performance engine fasteners before final installation. ARP Ultra-Torque far surpasses all requirements offered by previous ARP lubricants in terms of fastener pre-load repeatability and performance lubricating properties. ARP Ultra-Torque is a premier blend of extreme pressure lubricants combined with incredible anti-seize characteristics that perform amazingly well with all high performance engine fasteners. OBTAINS: 95%-100% of all ARP recommended installation pre-loads on the first pull, without cycling fasteners before final installation. MAINTAINS: all ARP recommended installation pre-loads within 5% on all remaining cycles, ensuring consistent and repeatable housing bores and/or cylinder bore dimensions (when using a honing plate) during machining, mock-up and assembly procedures. Saving you time and money! STABILIZES: all ARP fastener installation pre-loads within 5% between a group of fasteners such as the deck surface of a cylinder block, the main web of a cylinder block or across the cap of a connecting rod. No matter what torque cycle you’re on…ARP Ultra-Torque delivers more consistent, more repeatable fastener tension pre-loads than any other lubricant on the market today! Prevents seizing and galling on all threaded fasteners. Prevents rust and corrosion during the life of the lubricant. Effective lubrication range -50˚F to 2000˚F.